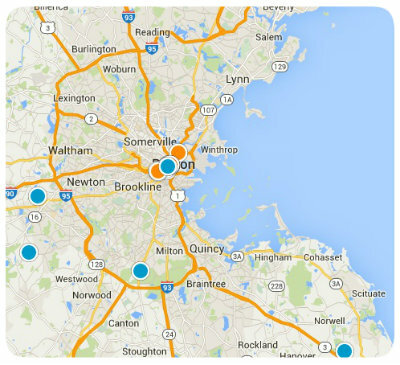 This is the most dedicated resource for Holbrook MA Real Estate - More Listings - Better results! Most homebuyers have tired of national sites that constantly show bad information, or worse: Holbrook MA Homes for sale that are gone before they ever see them. Never again. You can search better. Actively search for Holbrook Real Estate & homes for sale, condos or search for foreclosures, or simply sign up for our enhanced MLS Property search and let new listings for sale in Holbrook come to you. Holbrook is located in Norfolk County and has a stable population of between 10,000 and 11,000 residents as of the 2010 census. Holbrook was split off from the former Braintree Lands and at one point it was known as East Randolph. The town borders Braintree, Randolph, Weymouth, Abington Brockton and Avon. It's an affordable South Shore suburb and boasts easy access to transportation such as Commuter rail, bus lines, Route 37 and 139 as well as airports ( Norwood and Logan ). See Below for a small SAMPLE of Holbrook MA homes for sale updated every few minutes. Keep in mind this is just properties that have come on today! For a complete list of Holbrook homes for sale you can fill out the search at the top of this page. It has been designed to specifically find you More listings in Holbrook and avoid showing you old or outdated information. In addition it's local and serviced by the highest rated local Holbrook Realtors, so if you do find the home of your dreams, simply call or email and we can assist. We think Holbrook Real Estate is one of the best value buys in Eastern MA, but if you'd like to do some research and background on the town and community, visit Holbrook MA - the Wikipedia page for the town which has statistics, demographics, history and more related to Holbrook Real Estate market. We have 2 options for you. We can quite possibly provide a buyer direct to you. Our marketing techniques brings us a large list of active and qualified buyers at your disposal. We also offer a free and comprehensive Market Analysis. Most other Realtors spin through a home and give a vague asking price with the stipulation of a long, burdensome listing contract. Not Us, Not Ever. You will receive the most in depth information, tips on how to prepare your home... the expected SELLING price, and techniques that will bring an additional 6-10% in your pocket. All with no obligation. If you're a current resident or moving to the town, please visit Holbrook MA Schools today, it has the current calendar of events and schedule as well as updates on the Holbrook School system, direct from the horse's mouth! Sample Holbrook Listings from Today!